38 small beans bags for throwing. Make them yourself! Have two lines of seated participants facing each other; 4 or 5 people on each side to form two teams. Place the bucket in the middle of the two teams. Each player will throw the die to establish how many bean bags he/she may throw. When the last person from the first team finishes, count how many bean bags are inside the bucket. Do the same with the second team. The team that scores most bags in the bucket wins the game. Give out prizes for their efforts. I'm loving this idea, can any one give me an idea how big the bean bag should be for ease of throwing and handling I'm thinking about 6x6 inches filled with rice maybe! Hi, Sally the bean bags are usually 4 by 4 inches or 10 cm by 10 cm but you can do the size you like. Don’t fill them too much; they should be fairly soft for easy throwing. Good luck! What a great game will be trying this out, this site is the best. Thanks Yasmin, love to hear how it goes! Thank you Morena, great idea the Modified Pig Pong game! That is wonderful idea solange I organised similar game with my residents in the facility, I named Modified Ping pong table game. Seated all residents around the table, place a small bucket on the centre of the table and give 3 balls (different colours smiling face stress ball) to each participant. The object is to release the balls into the bucket so they bounce and throw the ball into the bucket; without losing any along the way. The score is 1 point for each throw. Is good for concentration, eye coordination and gently upper body exercise. They really have fun. we play a similar game at our Day Centre,, one side throws a dice,the other side has the chance to throw that number of bean bags in the bucket.Each side has a go the team who have most number of bags each time wins. 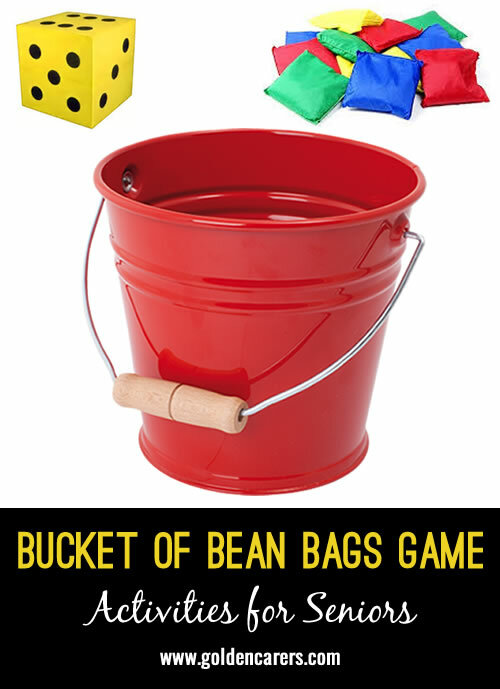 we use only 6 bean bags to match the dice ,,so if a member throw a six the other team has to try and get the six bags in the bucket,eg,thow number one dice then theother team throw one bag in the bucket.This is very popular game with our members,it sounds similar.